Tripp Lite Basic Power Distribution Units give IT Managers the ability to power multiple servers and vital networking hardware from a single input power source. Switch-free unfiltered electrical pass-through reliably distributes UPS or generator power to critical equipment in rack enclosures, network closets and more. Tooless mounting enables simple installation in button-mount compatible racks. Included mounting brackets support vertical installation in standard 2 and 4 post racks or other surfaces, such as under-counter or wallmount configurations. Plug retention brackets keep vital equipment plugged in and continuously powered. PDUV30HV 63.75 in. vertical 0U rack PDU supports 30A maximum capacity at 208/240V (agency derated to 24A). 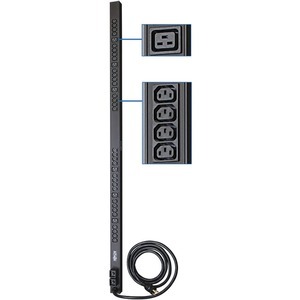 Includes 10 ft. attached line cord with L6-30P input plug. 32 C13 and 6 C19 outlets support up to 38 directly connected pieces of networking equipment. Outlets are arranged in two separately breakered 15A load banks.